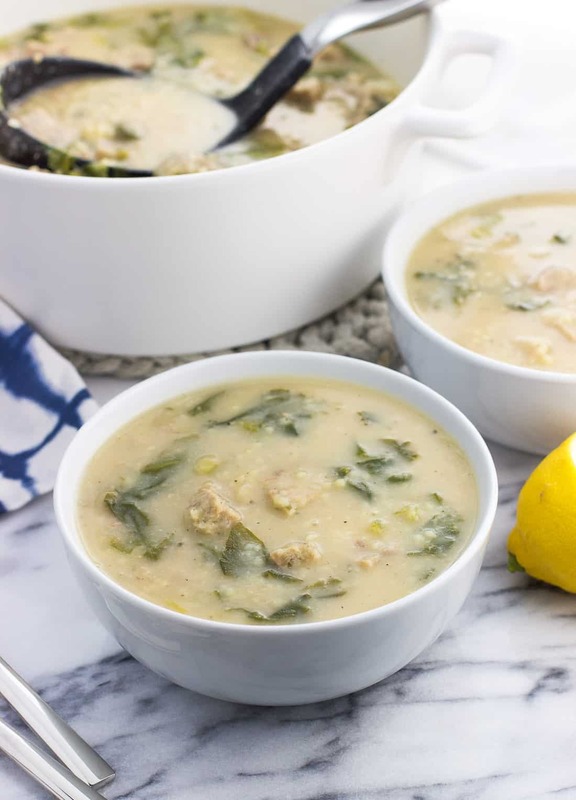 This Italian wedding soup with turkey meatballs is made even healthier with a sneaky ingredient blended into the creamy broth: cannellini beans. Bringing extra protein and fiber, the beans join escarole for nutrient packed additions to this year-round favorite soup recipe. 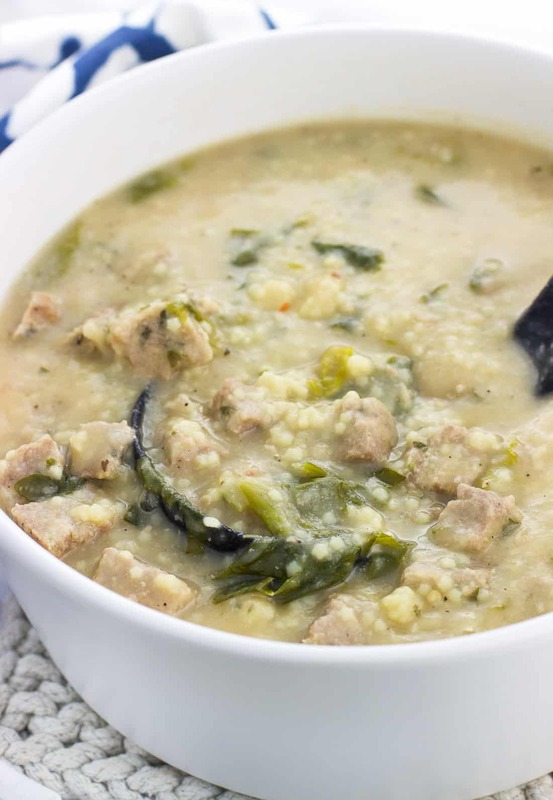 When I was growing up, Italian wedding soup was in regular rotation in our dinner menu. When everyone in the family loves the same relatively healthy meal, you’ve got a keeper. Depending on what we had, my mom would add escarole or spinach and always some sort of small pasta (acini di pepe, pastina, orzo). I’d live for the leftover portions after the pasta had gotten huge, because super-sized pasta just made it seem even heartier. 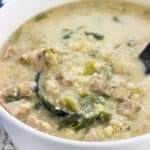 Being spoiled from homemade Italian wedding soup, I noticed a startling difference when I first encountered it commercially-made. The meatballs were round. See, the Italian wedding soup I grew up eating had little square meatballs. Meatsquares? I asked my mom what was up with those, and she let me in on her time-saving secret. 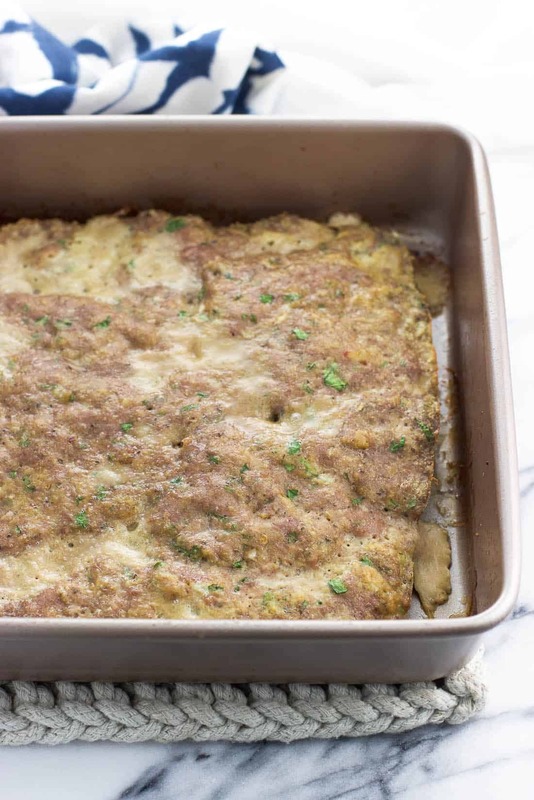 Instead of scooping and cooking a ton of mini meatballs, she added the meatball mixture to a baking dish in a thin layer and baked it in one large square. Once cooked, she quickly sliced the meat layer into small squares and added them to the soup. Efficient, right? Since I was on a mission to nudge up the nutrition, I made my Italian wedding soup with turkey meatballs. Using my recipe for Italian baked turkey meatballs (not dry! ), I shaped a layer in an 8”x8” baking dish with sides and cooked for fifteen or so minutes, or until cooked through. This yielded juicy, Italian-spiced meatballs without scooping scooping scooping. 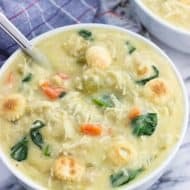 You can add all of the meatballs to the soup for a seriously hearty, meat-packed meal, or you can reserve a portion to eat on their own, or slice into strips for sandwiches, etc. When it comes to soup broths, more likely than not I will add a can of cannellini beans. But I don’t just throw them in – I blend them in. 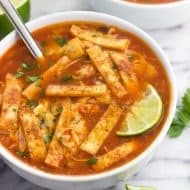 Once incorporated into the broth (either by use of an immersion blender or by carefully transferring to a standard blender), they go virtually unnoticeable as far as the flavor is concerned, only bringing with them extra nutrition and a thick and creamy texture, no cream required. 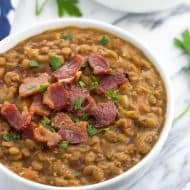 It’s the same method I use to make potato and white bean soup with kale, which has become a reader favorite. Have you tried it yet? One large Russet potato makes an appearance here, too. Now that we have our broth and our meatballs, onto the greens and the pasta. Escarole is my first choice, but spinach or kale would also work if you can’t find escarole or would rather use up what you have on hand. For the pasta part, I used pastina here because evidently there was a run on acini di pepe at the store. Either works! 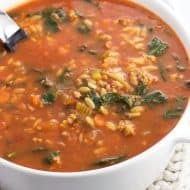 Just add whatever pasta you’re using into the simmering soup in accordance with the suggested cook times on your packages. Don’t use too small of a dish for baking the meatballs because the meatball mixture will come away from the sides as it bakes. If you can’t find escarole, you can use spinach. Since escarole requires more simmering time in a soup than spinach does, I’d add the spinach just a minute or so prior to serving. A squeeze of lemon juice and/or a heavy sprinkle of grated Parmesan or Pecorino-Romano cheese is highly recommended for serving! 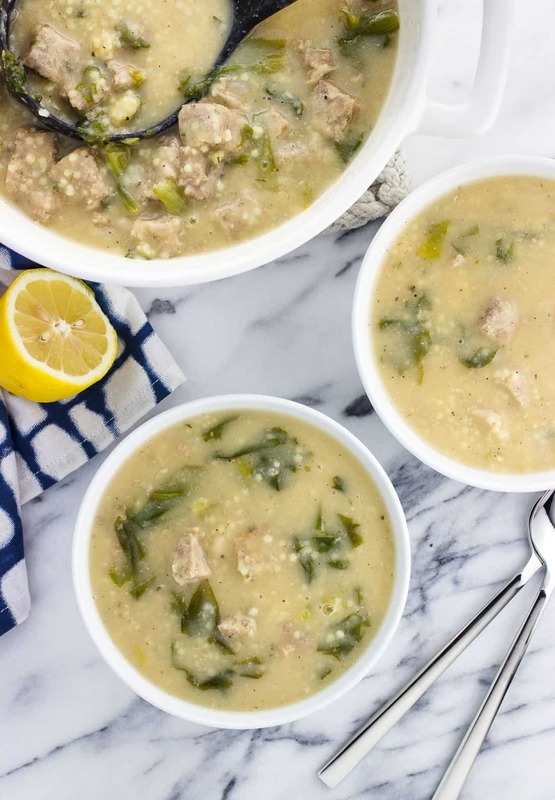 This Italian wedding soup with turkey meatballs is made even healthier with a sneaky ingredient blended into the creamy broth: cannellini beans. Bringing extra protein and fiber, the cannellini beans join escarole for nutrient packed additions to this year-round favorite soup recipe. Preheat oven to 375°F and spray an 8" x 8" baking dish with cooking spray. Add all meatball ingredients to a large mixing bowl and mix until just combined. I like to put on disposable gloves and mix everything with my hands. Press meatball mixture into the greased pan in an even layer. Bake for 14-15 minutes, or until the mixture is cooked through and the thickest part registers 165°F. Set aside to cool slightly before slicing into cubes. Add olive oil to a large pot set over medium to medium-high heat. Once heated, add chopped onion and cook for 2-3 minutes. Add garlic, salt, and pepper, and cook for another 2-3 minutes. Add cubed potato and saute for 1-2 minutes. Pour in 2 cups of the broth and let simmer and cook for 7-8 minutes. Add rinsed and drained cannellini beans and cook for 3-4 minutes. At this point remove the pot from the heat. Blend contents of pot well with an immersion blender, or carefully transfer everything to a blender and blend until smooth. Transfer pureed soup mixture back to the pot, and set the pot back on the stove over medium heat. Add remaining 2 cups of broth and 2 cups of water to the broth and stir until combined. Add the escarole to the pot and stir. Let the escarole simmer and become tender for about 10 minutes. Add the meatballs and stir to combine. Raise heat to medium-high and add dry pastina. Cook for 5 minutes, stirring to prevent the pasta from clumping together (but if that does happen, just break them up with the back of a wooden spoon). Once the pasta is tender, serve with a sprinkling of Parmesan or Pecorino-Romano cheese and a squeeze of fresh lemon juice (optional). 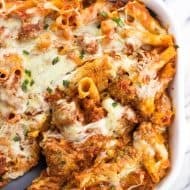 Here are the Italian Baked Turkey Meatballs in more of a traditional form. 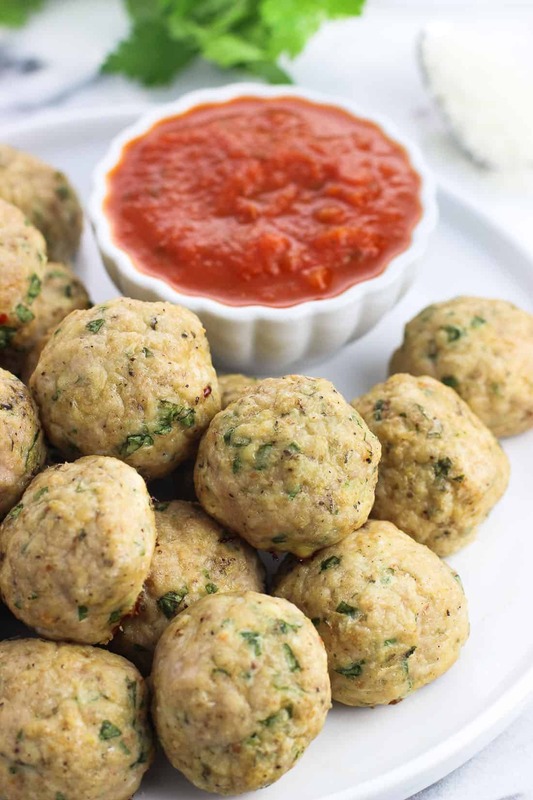 They’re great as appetizers when served alongside warmed marinara sauce! 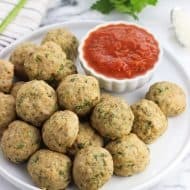 Little square meatballs. A brilliant idea!